This post is really just a repository for a few leftovers that are not quite postworthy, but combined do create a theme. The subtitle of CMH Gourmand is “Ice Cream Capital of the World”. I still be believe that. Put anyone in my company for about four to five hours and I can prove my statement with tasting and commentary. Where the people have Beer Floats with an Ohio made ice cream. In honor of National Ice Cream Month, I declare this Columbus Beer Float Week. The Hills Market is serving up Beer Floats on Wednesday (July 21st). 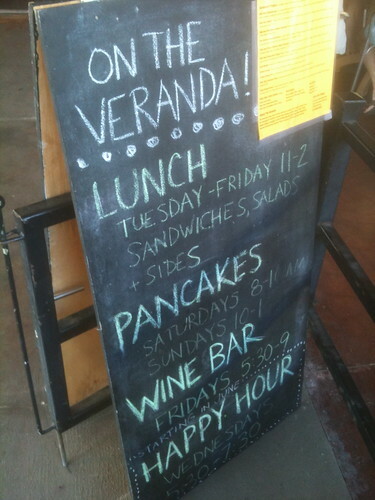 The Hills hosts many great eating events on their veranda, this is one. The Hills is pouring five different floats featuring Ayars Family Farm Ice Cream (new, from Mechanicsburg, Ohio) and a variety of stouts, lambics and unique beers that bode well with ice cream. The floats are $1.75 each or you can try a flight of five for $7.50. Floats will be poured from 5:30 to 7:30 pm as part of the Harvest Happy Hour. Bodega in the Short North is also featuring Youngs Chocolate Stout with Jeni’s Salty Caramel Ice Cream. Food historians may quibble in the future, but it will be noted in the record that the widespread use of and advocacy for Beer Floats began in Columbus in early 2008. Clearly some type of visionary genius was the guiding hand for this populist delicacy. A city which can support a growing Independent ice cream empire. 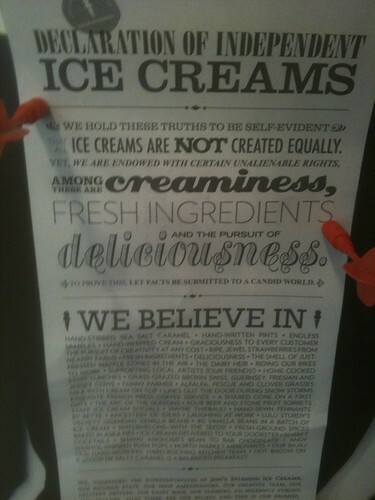 It was tea in 1773 and now there is a call for ice cream independence in 2010. A flyer to this effect was seen in the Short North. Among the ice cream rights that we have: creaminess, fresh ingredients and the pursuit of deliciousness. These are civil rights I can support. On a side note Jeni’s was also granted a code variance that will allow it to open a location (within walking distance of Gourmand Manor) in Clintonville as early as September. Unlike the tea party, there will be no swarms of residents dumping ice cream into the Olentangy we will be licking it all up. In Other Jeni’s news, Jeni Britton Bauer has been selected as a Central Ohio Terra Madre delegate. Her supplier of milk cream for ice cream base, Warren Taylor from Snowville Creamery has also been selected for Terra Madre as well. There has been some question about Columbus having the ability to compete on the national food scene. As if being the Ice Cream Capital of the World was not enough, our community as well as the the farmers that supply our artisans and chefs will be sending nine people to Italy to talk food at Terra Madre. That is a big deal. This entry was posted on July 19, 2010 at 1:09 PM	and is filed under beer, Columbus, ice cream. Tagged: Ice Cream Capital of the World. You can follow any responses to this entry through the RSS 2.0 feed. You can leave a response, or trackback from your own site. 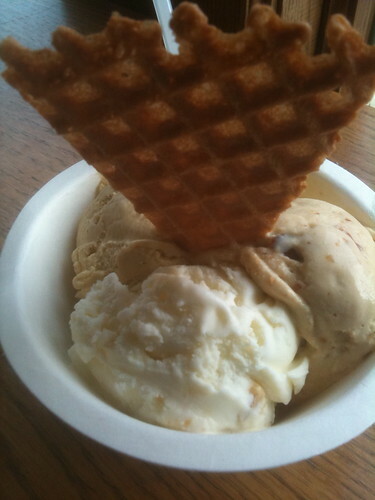 Hell to the yeah for Jeni’s! She and her workers deserve every honor bestowed on them. While it’s not quite a beer shake, my wife and I used to make root-beer floats with frost-top (from Ohio), Jeni’s bourbon butter pecan (from Ohio) and actual maker’s mark (sadly not from Ohio). I don’t drink anymore so (sadly) I can’t partake in these anymore, but when I did it was one of the best possible ways you could imagine to drink bourbon, eat ice cream, or drink root-beer. CMH G Reply: This warrants IMMEDIATE attention! I am on this. I forgot to click the box to notify me of follow-up comments. Clicking that now.